MV Taíno, which departed Jan. 8 from its mainland homeport of Jacksonville, Fla. (JAXPORT), is the second of two ConRo vessels constructed for Crowley. 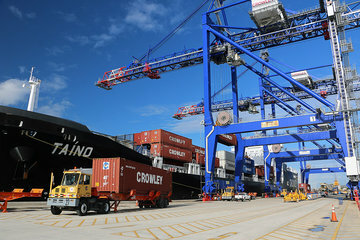 Sister ship MV El Coquí began its first-in-class service in July 2018.The ships, built specifically for the Puerto Rico trade, are 219.5 meters (720 feet), 26,500 deadweight tons (DWT), and can transport up to 2,400 twenty-foot-equivalent container units (TEUs) at a cruising speed of more than 22 knots. The ships carry a wide range of cargo types and sizes, including: 53-foot by 102-inch-wide, high-capacity containers; up to 300 refrigerated containers; and 400 cars and larger vehicles in the enclosed and ventilated vehicle garages that are unique to the trade.